Well here I am in my new blog home – finally. Yesterday was a slightly hair-raising day. At one stage one of the techies helping me restored my database but didn’t check to see that it had worked and and it hadn’t so my site was MIA for a few hours. Anyway I hope this is going to work nicely now. I have to import all my lovely subscribers again but hopefully that won’t take too long and then things can get back to normal. There are few links that are broken and I’ll try to fix those up over the next few days. I know the tutorial and recipe links on the sidebar don’t work but if you find any others please let me know. Thanks. Having finished the Andalusian Tile Quilt – which by the way has now been washed and is all crinkly and lovely – I had to decide what to work on next. 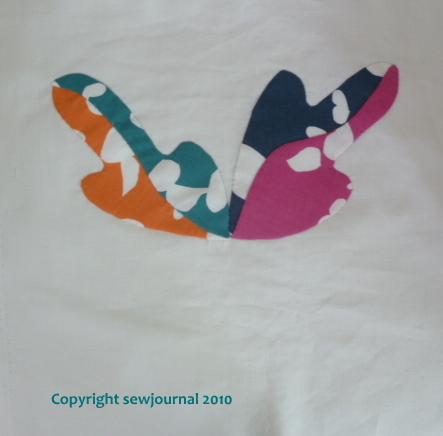 I had a hankering to do some applique and so I have turned my attention to the quilt I am making with the hand-printed fabric I bought from Kalla Studio. (Oh no! I just went to check her site to make sure I had the link address right and she has some new designs and they are so tempting…) Anyway I decided to applique some blocks to go between the blocks of 16 squares that I have already made. here’s what I’ve done so far. This is just half of the finished block design. I am calling the quilt A Splash of Colour.